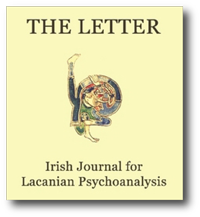 This issue of The Letter opens with a paper by Julien Quackelbeen which addresses the question of what answers psychoanalysis can provide to Kant’s questions, -What can I know? What ought I to do? Whay may I hope for?, – questions put to Jacques Lacan by J.-A. Miller during Télévision. Quackelbeen, with Lacan, argues that since the discovery of the unconscious all these questions need to be framed in a totally different way, taking as their starting point the fact of the human subject as one who speaks, as one who is subject of a fundamental division, – Freud’s Ich- Spaltung. When, as a consequence of Freud’s discovery, the Kantian subject receives its unconscious and when Lacan formulates its dependence on language, each of these questions takes on a new slant, – the psychoanalytic response to this defining the ethics of its practice and establishing its difference from other discourses. It must surely have struck the reader of the Ecrits how often Lacan refers to Kant. The reader of the Seminars is so familiar with this reference to the great philosopher of Koningsberg that in the long run he is erroneously going to take it for granted. When Jacques -Alain Miller starts the sixth chapter of Television with the invitation to make a stand against Kant, he is not only aware of the fact that his question is stimulating, he also realizes that it nourishes a fundamental ambiguity. This ambiguity is revealed by two possible characterizations of Lacan: “Lacan, philosopher amongst analysts” versus “Lacan, analyst amongst philosophers”. Miller had supported the philosopher Lacan when he invited him to give a lecture on the foundations of Fregian logic during his 1963-1964 seminar. When he abandons his masters Canguilhem and Althusser, he will do so to join Lacan, the analyst. It is common knowledge that Freud started as the pupil of his hysterical patients. He wanted to know and that’s why he kept on listening to them. During that time, he coined the idea of psychotherapy, which was rather new at the end of the nineteenth century. Today, psychotherapy has become a very common practice; it is even so common, that no-one knows any longer what exactly it means. On the other hand, hysteria as such has almost disappeared, so much so that in the latest version of the DSM, the Diagnostic and Statistical manual, there is no longer any mention of it. This means that my paper is on the one hand about something that does not exist any more, and on the other hand about something that exists far too much… So, it will be necessary to define what we, from the psychoanalytic point of view, understand by the word “psychotherapy” and what we consider hysteria to be. Let us start with a common clinical situation. A client comes to see us because he has a symptom that has become unbearable. Within the context of hysteria, this symptom could be almost anything, starting with classical conversion, phobic complaints, sexual and/or relational problems, and ending with the more vague complaints of depression or discontent. The patient presents his problem to the therapist, and the normal expectation would be that therapeutical efforts will result in the disappearance of the symptoms and in a return to the status quo ante, the previous state of health. The first symbolic binary language of “fort” and “da” introduces the subject to the world of the signifier, in which desire is implicated. The signifying chain implies an historicization of events – “fort” is significant only in terms of “da”, which has preceded it – and vice versa. Language and narrative attempt to articulate desire, but something always escapes, a beyond of language. Without language, the question of desire would remain closed – yet through language the subject eludes an ultimate satisfying of desire, which would bring death. Sade, as perverse subject, sought to approach the object of desire directly, risking the death of desire in the process. Yet he was more famous for his writings than for his actual misdeeds; his writing allows a tension to be maintained between the subject and the object and between the subject and the object of his desire. It is impossible to read Sade in a dispassionate way. As linguistic and perverse act, The Hundred and Twenty Days of Sodom involves the reader as participant in Sade’s discourse. One is struck by a peculiar ennui – it is difficult to be as enthusiastic as Sade’s characters about their adventures. The most conscientious reader finds it difficult to accompany Sade’s heroes to a supposed endpoint (which, however, never comes). Far from being merely a pornographic archive, however, Sade’s discourse opens up essential questions regarding language, desire and death. Ex umbris et imaginibus in veritatem…. The debate carried on through his Ecrits is, Lacan wrote in 1966, “le debat des lumires” – the age-old intellectual struggle pursued by men and women to break out of the shadows and the images in which reality, and in particular the reality of those whom they love best, is shrouded, in order to come to live in the truth: the search for more light, “Mehr licht”, in Goethe’s dying words. For Lacan, Freud’s discovery of the unconscious subject of speech brought a major new contribution to this debate and from his early writings in the 1930’s – especially in Beyond the reality principle – he castigated the second generation of psychoanalysts for having overlooked the epistemological implications of unconscious “thinking” and with having regressed to pre-Freudian simplifications in trying to understand the genesis of neurosis and its cure. “Tongue”, La langue, Lalangue: this word “tongue” I take as a signifier of this congress, entitled “The Subject of the Unconscious and Language(s)”. Tongues have uttered “tongue” scores of times in the presentations and discussions during these days. Now in a Cantonese Chinese restaurant, you would never hear the word “tongue” pronounced, even though beef and ox tongue are popular delicacies. Why? Because the sound of the word “tongue” (shuh) also means “losing”, as in “losing money”. Superstitious as Chinese are, you would never suggest the topic of “losing money”! So instead of pronouncing the word shuh as indicated by the Chinese character on the menu, the waiter announces the work li (which means “gaining”, as in “gaining money”). In English the waiter’s spiel would sound like this: “We have very nice ox-gaining-money today”.